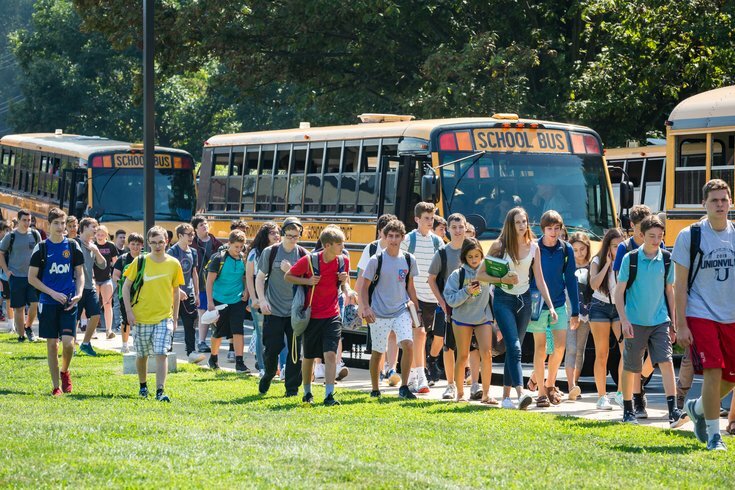 Students from Unionville High School in Kennett Square, Chester County, walk toward their buses shortly after dismissal last Wednesday. Last year, the district pushed back start times to 8 a.m. at its middle and high schools. "This is an initiative that is not without its challenges," Superintendent of Schools John Sanville said. Matt Daniels remembers seeing a sleepy scene as he scanned the classroom one morning during his freshman year at Unionville High School. Several students were resting their heads on desks. No one was enthusiastically engaging the teacher. And one student had even fallen asleep. So when Daniels' teacher asked how the Unionville-Chadds Ford School District might improve the school day, the answer seemed obvious. How about bumping back the school's 7:35 a.m. start time? "I was typically going to bed around midnight, maybe a little later," said Daniels, 19, now a student at the University of Pennsylvania. "That was pretty common with my classmates as well." That – along with an early morning bus pickup – left Daniels and his classmates with little time for sleep. They often compensated with large coffees and energy drinks. Now, Unionville-Chadds Ford students can sleep a little later each morning – and they have Daniels to thank. Daniels kickstarted a years-long effort to determine the health benefits and logistical challenges associated with later start times. He spearheaded a student-led, multi-school forum that laid the groundwork for a district committee to make its own evaluation. 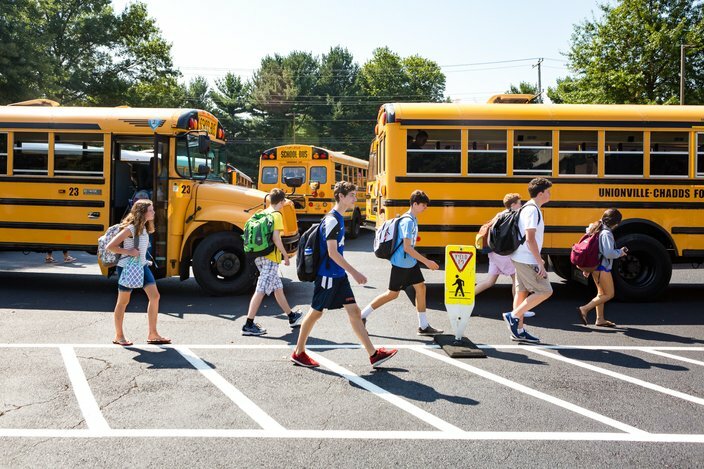 Last year, Unionville-Chadds Ford became the first school district in Chester County to bump back the start times at its middle and high schools. The move allowed students to get additional sleep – a change that research shows increases physical and mental health. In doing so, Unionville-Chadds Ford joined hundreds of school districts across the country that have jumped into a pool of obstacles and emerged with a realistic solution. But it remains one of only a few in the Philadelphia region to do so. Now, classes at Unionville High School and Patton Middle School start at 8 a.m., about 30 minutes shy of the 8:30 a.m. start time recommended by various medical organizations. But it marked the best way to give students a few more ZZZs without a complete – and expensive – overhaul of busing, athletics and after-school activities. "This is an initiative that is not without its challenges," Superintendent of Schools John Sanville said. "At the end of the day, the health benefits to our kids outweighed the challenges that we would have to overcome. Really, in a nutshell, that's what happened." Teenagers are known for pushing boundaries. But when it comes to bedtimes, science shows they are not intentionally staying up late. They are night owls by nature, with their sleep onset typically arriving around 11 p.m.
"That's just when their internal clock is set," said Dr. Thanuja Hamilton, a certified sleep medicine specialist in South Jersey. "It just tends to be later. As they grow older, it advances earlier." Melatonin – the hormone that moderates sleep – typically kicks in an hour or two before most people go to bed, Hamilton said. But among teens, that secretion begins later in the evening. With many schools starting class around 7:30 a.m., that makes it difficult for teens to get the 8 to 10 hours of sleep recommended by the American Academy of Pediatrics. "They're only getting about 7 hours of sleep to begin with – if they're really going to bed at 11 p.m. and waking up at 6 a.m.," Hamilton said. "Boom, they're automatically sleep-deprived." That, in turn, reduces creativity, alertness and focus, Hamilton said. It heightens tardiness, depression and anxiety. And it prompts teens to replenish their energy by consuming more sugars and fats – a habit that can lead to obesity, heart disease and diabetes. Four years ago, the American Academy of Pediatrics recommended that middle and high school start no earlier than 8:30 a.m., declaring chronic sleep loss among teens one of the most "easily fixable" public health issues facing Americans. One year later, the Centers for Disease Control and Prevention issued the same recommendation. For many districts, it's not such a simple change. Even a modest tweak of the schedule can throw a big kink into busing schedules, after-school activities and athletic programs. And pushback from teachers, staffers and even students is not uncommon. "It's not for the faint of heart," Sanville said. The Unionville-Chadds Ford School District became the first in Chester County to bump back its high school and middle school start times, an effort to help students gain a few more minutes of sleep. When students first approached Sanville about moving start times later, his thoughts immediately focused on the challenges at hand. How would that impact busing? Would that mess up after-school activities? What obstacles would this create for parents or staffers? But intrigued by the possible health benefits, district administrators formed a committee to examine the issue. "As we went through this process, we were very mindful of how we could address, really, each and every concern that different stakeholders in the community had," Sanville said. "We addressed as many of them as we could." The committee examined the impact six potential schedules had on transportation. On this matter, the elementary and secondary schedules were intertwined. The district's buses first transport secondary students and then return to bus elementary students, who start and end school later. Flipping the elementary and secondary schedules gave teens more time to sleep, but it left elementary students waiting for buses in the dark – a clear safety hazard. Bumping back both schedules by an hour would have meant elementary students sometimes got home in the dark and would have cost the district $380,000 to add more buses and drivers. Merging the schedules proved financially burdensome – it would have cost $3.85 million to purchase 43 new buses and hire 43 more drivers. Ultimately, the district settled for a modified pushback that bumped the secondary schedule back by 25 minutes and the elementary schedule back by 15 minutes. That kept elementary students safe, added only about $40,000 of transportation expenditures and gave secondary students more time to sleep. It also alleviated concerns regarding after-school activities – particularly sports. Because other schools remain on the earlier start schedule, Unionville-Chadds Ford athletes now miss more class time traveling to away games. But they don't miss as much as they would with an 8:30 a.m. start. Nor did the district have to install additional field lights that would have been necessary for later practices. "There was a myriad of moving parts to do this and to do this well," Sanville said. There was one major challenge the district could not completely solve – meeting the needs of every parent and staffer with childcare issues. "We understand for a segment of our community this change has been a sacrifice," Sanville said. "And we appreciate that sacrifice, which is really one that they're making. It's for the greater good of our kids." But was such a minimal change in start times really worth all that hassle? Early indications suggest that it was. A survey conducted by the district found most secondary students were going to bed at the same time, but gaining – on average – 15 to 30 minutes of sleep. Students reported feeling more alert and less sleepy during class. During the 2016-17 school year, 70.5 percent of middle school students awakened before 6:15 a.m. That figured dropped to 27.9 percent last year. High school students reported similar responses. The district has not attempted to quantify whether the changes impacted academic performance. But Sanville said both faculty and parents immediately noticed students were more engaging. "It's not science; it's all anecdotal," Sanville said. "But I can tell you positive feedback outweighed negative feedback on this. Maybe by 10-to-1." The Solebury School, a college preparatory boarding school in Bucks County, found similar results after pushing back its start times two years ago. The school adopted an 8:30 a.m. start – a 30-minute change – by overhauling its class schedule. Instead of daily classes lasting 50 minutes, they now last 80 minutes and meet every other day. The final buzzer still sounds at 3:30 p.m., allowing after-school activities to remain unaffected. The new schedule not only created more time for sleep, but it also eased homework loads, too. In a survey conducted by the school, 75 percent of students said they used the later start time to get more sleep or eat breakfast. About half reported feeling less stress. "Over the course of the year, we (teachers) regularly talk about students who are at risk," said Rick Tony, Solebury's director of studies, who oversaw the schedule changes. "They might have grades in the D-range or in the F-range. The number of students whom we discuss has either remained steady or they've gone down." Of course, the Solebury School could make the changes without many of the hurdles facing school districts. As a boarding school, many of its students live on campus. And it offered breakfast for those who rely on buses from school districts – which could not be altered. 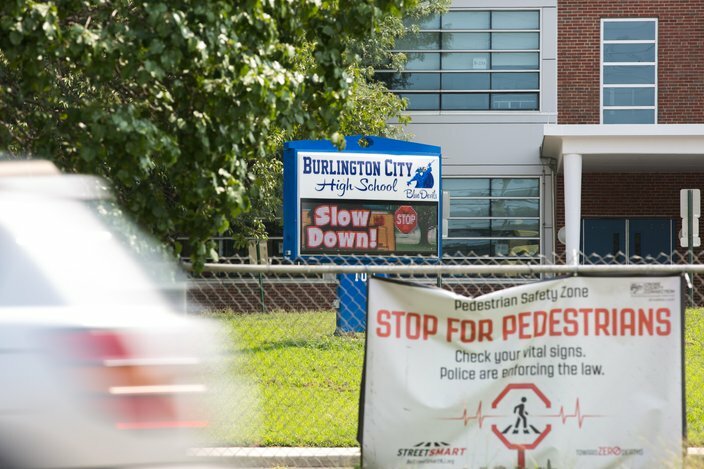 Signs outside Burlington City High School warn drivers to slow down and stop for pedestrians near Route 130. The school district bumped back school start times this year so that students no longer have to walk along busy roads in the dark. Burlington City Public Schools will be the next local district to make the switch. Burlington City High School, with students in grades 7 through 12, will start at 8 a.m. when class resumes on Wednesday – 20 minutes later than last year. Dismissal time remains the same. The health benefits tied to later start times was the driving factor behind the change. But Superintendent Patricia Doloughty said district administrators also wanted to prevent students from walking to school in the dark. Route 130, a busy, four-lane highway, cuts through the center of Burlington and borders the high school. Two years ago, a 17-year-old student was killed by drunk driver as he walked along the highway. The crash occurred during the weekend, but district administrators remained concerned. "We are not a busing district," Doloughty said. "They walk along 130 to get to school in the dark in the winter months. It's our biggest concern." Doloughty said she has not received any negative responses from parents – which has not always been the case for districts adopting later start times. "I've talked to students who are looking forward to it and were very receptive to having a little more time in the morning," Doloughty said. "There hasn't been any backlash from parents to that. They understand the challenges we have with Route 130." Other districts, like Lower Merion School District in Montgomery County, continue to examine the possibility of later start times. In others, like the Owen J. Roberts School District in Chester County, parents are lobbying hard for changes. Whether the School of Philadelphia – the largest in the region – is or would be considering later start times remains to be seen. A spokesman did not respond to a request for comment. Lower Merion formed a committee four years ago to examine the benefits and challenges of a later start time for its high school students. The committee submitted a report to the school board in May 2015, but a school spokeswoman said the district is not close to a decision. District officials remain conflicted by the same challenges nearly every district faces – transportation schedules, childcare obligations and after-school activities. They also are researching whether students would actually go to bed at the same time. "Prior to any decision or implementation, a lot more community input/feedback is needed and the timing and methodology for that is still being developed," spokeswoman Amy Buckman wrote in an email. Sanville recognizes such challenges. But he also foresees later start times as the way of the future. As more districts adopt them, it becomes less challenging for others to do so. Athletic activities realign. Busing – especially for districts without their own fleet – becomes less of an obstacle. And parents see the advantages. "If we know that this makes a difference from a student health perspective, I think we all ought to be considering doing it," Sanville said. "If we do it together, I think that it's a lot easier. There's safety in numbers."